Three-dimensional (3-D) printing, also known as additive manufacturing (AM), can transform a material layer by layer to build an object of interest. 3-D printing is not a new concept, since stereolithography printers have existed since the 1980s. The widespread availability and cost-effectiveness of the technology has allowed a variety of modern applications in biomedical engineering. The contemporary process of layer-wise additive manufacture is nevertheless slow and impacts the rate of object fabrication for objects with ridged surfaces. Continuous stereolithographic printing can overcome the limits by increasing print speeds to generate objects with smooth surfaces. 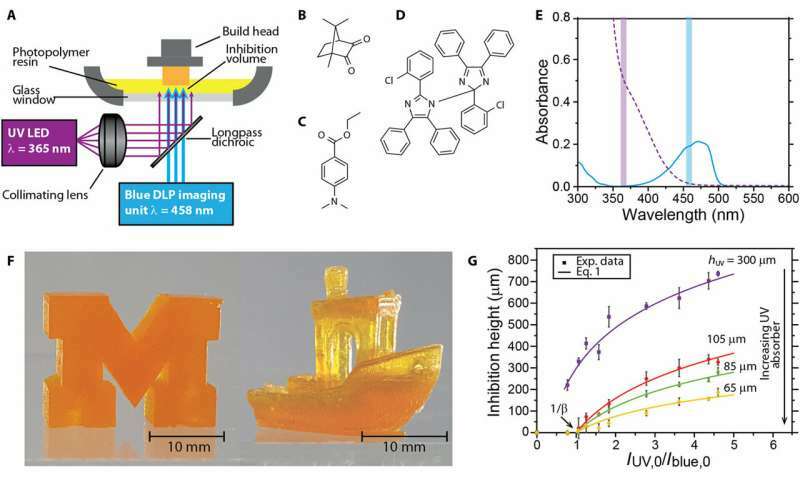 Now writing in Science Advances, Martin P. de Beer, Harry L. van der Laan and co-workers demonstrate a new method for rapid and continuous stereolithographic additive manufacture (SLA) in a single shot by interfacing the raw material with two wavelengths of light. The materials scientists developed a method using two sources of light; one to solidify the resin and another ultraviolet light to prevent resin curing on the device window during object fabrication. A zone without unwanted solidification (inhibition volumes) allowed efficient use of resins and boosted the speed of 3-D printing in a single exposure, in contrast to layer-wise, conventional manufacture. A variety of materials, including thermoplastics, polymer resins and inorganic powders have been used as media for additive manufacture (AM), with a variety of methods including material extrusion, to powder bed fusion and binder jetting. In particular, stereolithographic AM (SLA) was of interest in the study since it is based on a patterned illumination source to cure cross-sections of a desired geometry. In the study, de Beer and Laan et al. developed an AM system that could print continuously, at relatively high linear velocities to form 3-D structures in a single exposure. The experimental setup included a build head drawn upward from a photopolymerizable resin and two illumination sources with optics operating at different wavelengths (365 nm and 458 nm). In the experimental setup, patterned illumination passed through a transparent glass window from below and initiated resin polymerization. Illumination with a second wavelength inhibited the polymerization process immediately adjacent to the glass window to allow continuous operation by eliminating polymer adhesion to the glass. De Beer et al. achieved print speeds of up to two meters per hour using a process compatible for a variety of resins including acrylates, methacrylates and vinyl ethers. By varying the intensity of light on per-pixel basis, the system could also perform material surface patterning in a single exposure of the layer, without translating the stage. A unique feature of the experiments developed by de Beer et al., was the achievement of volumetric patterning using a multicolor system for photochemical polymerization initiation and inhibition. For photopolymerizable resins, the scientists used camphorquinone (CQ) and ethyl-4(dimethylamino)benzoate (EDAB) as a visible photoinitator and co-initiator. For the photoinhibitor they used bis[2-(o-chlorophenyl)-4,5-diphenylimidazole] (o-Cl-HABI). 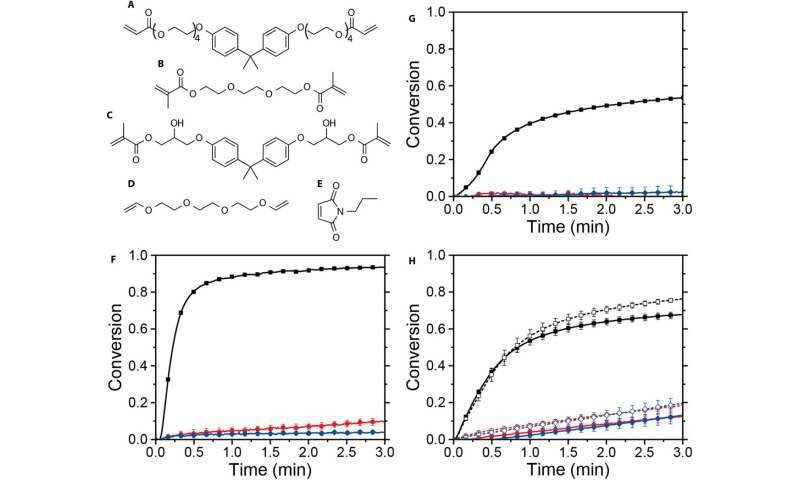 In the process, one wavelength photochemically activated polymerization, while a second wavelength inhibited that reaction after forming the desired geometry. To control the thickness of the polymerization inhibition volume adjacent to the window of the device, the scientists varied the ratio of light intensities of the two illuminating sources using custom LabVIEW software. By design, polymerization could therefore continuously occur above the region for object printing, by avoiding deleterious window adhesion. The scientists used DesignSpark Mechanical 2.0 or Autodesk Fusion 360 to design models for 3-D printing and exported them as STL files (file format created in 3-D systems).To create image slices from the STL files, they used the slicing feature in Autodesk Netfabb 2017. 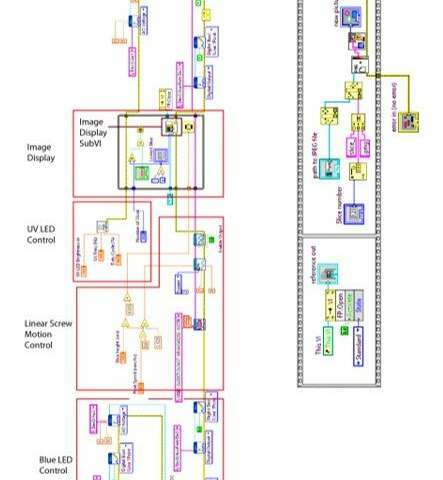 During printing, they displayed the image slices concurrently while moving the build head using LabVIEW VI. The maximum print speed for continuous speed and continuous printing depended on the intensity of the initiating and inhibiting wavelength and the amount of energy required to cure the resin, as derived in the study. As a proof-of-principle, de Beer et al. printed parts at speeds approximating 2 m/hour to create argyle structures. Afterward, the scientists rinsed the printed parts in isopropanol to remove uncured resin. To characterize the 3-D products, de Beer et al, used a gas pycnometer to measure the volume of the 3-D printed parts. During the experiments, the scientists placed a sample mass in a cylindrical sample cell, which was pressured with helium gas thereafter. Then by releasing the pressure, they were able to expand the volume of helium gas, which converted to the volume of the sample. The scientists similarly conducted experiments to determine the gel fraction of samples prepared via rapid and continuous 3-D printing. In the manufacturing system, de Beer et al controlled the depth to which light penetrated and ultimately cured the resin by controlling the resin's blue absorbance, which was derived in the study. The process of photoinitiation and photoinhibition described in the study was transferable to a variety of monomer classes for use in the setup. The techniques and results observed in the study are currently unattainable with contemporary methods. 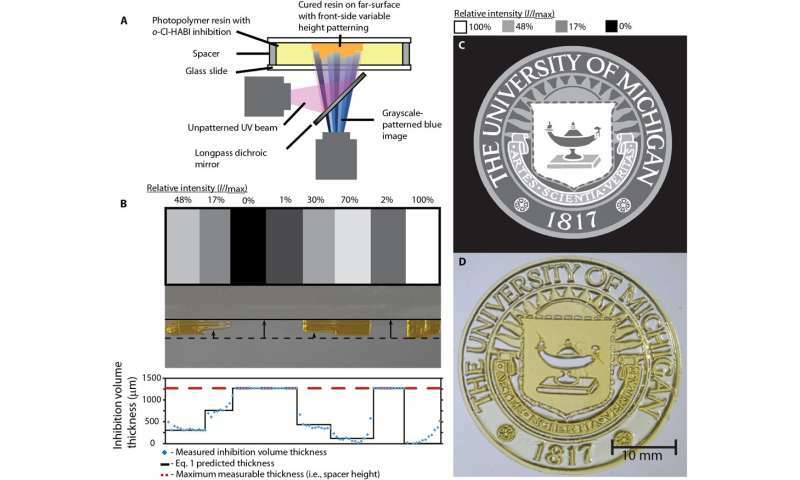 Previous studies could only attain two-color irradiation for subdiffraction and direct-write photolithography using different photoinitator and inhibitor systems, to those detailed at present. In addition, de Beer and Laan used variable intensity irradiation to produce cured materials with intricate surface topographical features in a single step. This allowed rapid generation of personalized products, while eliminating the multiple and time-consuming steps typically used in microfabrication. 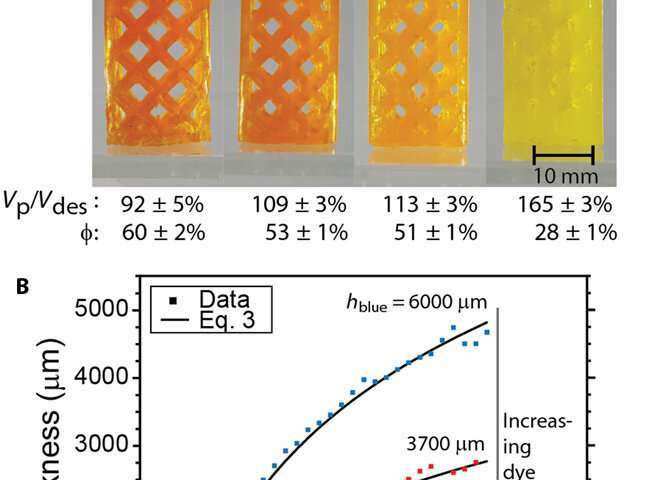 In this way, the application of multiwavelength systems to SLA demonstrated in the study forms a new direction in light-assisted additive manufacture. In addition to volumetric polymerization control detailed in the context, the scientists envision the two-color system may allow rapid fabrication of parts with localized variations of materials and chemical properties in a single step. 3-D printing has taken the propaganda vaporware spotlight away from decades of future flying cars. It makes nice customizable models, and toys, and I'm sure it will only get better at doing that type stuff, with color, texture, etc. The big problem is once you develop a process to print something substantial from a materials standpoint, like steel, for example, you still have to dope it with something to get the 3-D printer to work, and that something is extremely unlikely to make the composite better than regular steel. So, for performance applications, 3-D printing will most likely remain inferior. We can hope to discover a happenstance of confluence between the composite and a certain type of material from a performance standpoint. But maybe just be a one-off fluke, even if it happens, unless it also happens to be the wonder material.